Do not approach a design problem with any preconceived ideas, as to how it can be solved. Be open minded right from the start. Select a design problem to solve, one that allows you plenty of design scope. Often the best design problems are not those that affect you, but those that are identified by your friends, associates and family. If you become a designer, you will be working for clients that will present design problems to you. It is rare that a professional designed solves his / her own design problem. However, this does not prevent you selecting a problem that you personally have identified. Just be aware, that a design problem being faced by a group of people, usually allows for a greater depth of study. Explain the design problem, in detail. This may mean discussing the problem with those people who are affected by it. Clearly describe and identify the user group / potential clientele / target market. These will be the people who have identified the design problem. Be quite specific when describing and identifying this group of people. This is sometimes called a user profile. Write a short design brief. This should be to the point with your aims for the product clearly stated. Do not put excessive detail into this, a limited number of sentences is all that you need at this point. When writing about your Design Problem and constructing your Design brief, ensure that you cover the four areas outlined below. Start with a couple of photographs that show the problem you want to solved. Write about the design problem, in detail. Most of my friends complete their home work, sat on a chair or settee, in front of the TV. Or they work in their bedroom, sat on an ‘easy’ chair. They rest their paper on a board, which rests on their knee / lap. The problem is that it is difficult to support paper and consequently to write neatly, even if work is supported on your knee. Office workers who take work home, also have this problem, when working in a more relaxed way, such as this. Lighting is also a problem. The light source never seems to be in the right position for work and a shadow is cast preventing work being seen properly. This is irritating and probably harmful to eyesight, if working for sometime. Working with a board resting on a knee or lap, is not the most comfortable position. It eventually causes neck and back ache and results in a lack of concentration and focus. This inevitably affects the quality of work. 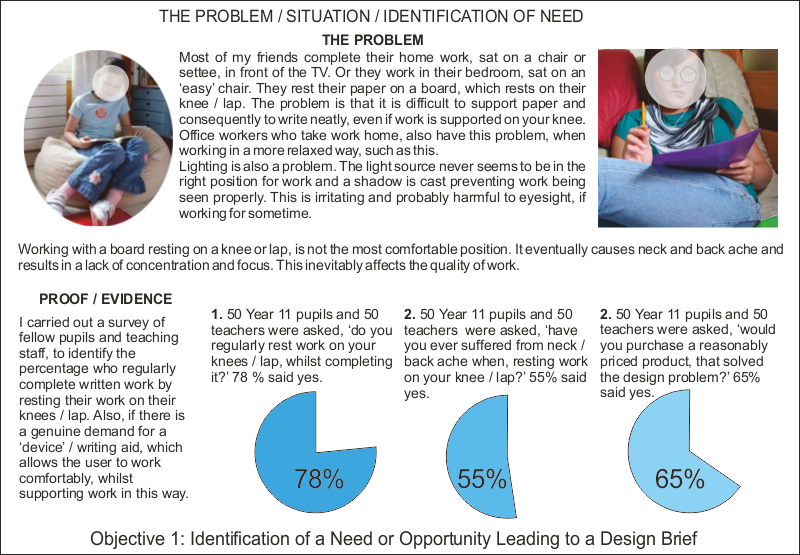 I carried out a survey of fellow pupils and teaching staff, to identify the percentage who regularly complete written work by resting their work on their knees / lap. Also, if there is a genuine demand for a ‘device’ / writing aid, which allows the user to work comfortably, whilst supporting work in this way.